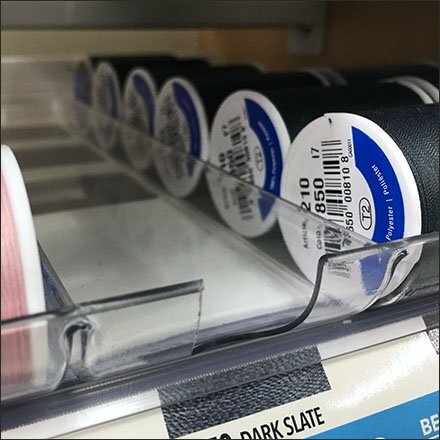 This Gravity Feed Acrylic Endcap Thread Display is brought to you by the famous name Coats. Trays are clear acrylic which helps light enter the display for improved visibility, color recognition, and elimination of shadows. Though mainly hosting spools of thread, bobbins are accommodated at the base. Ganged two wide, the display perfectly fits and Endcap. Consider the design and construction in the Gravity Feed Acrylic Endcap Thread Display gallery of images. Seen at Target.